Because the requirements to be an HR professional are stringent, the job market in this industry is extremely competitive. To have hiring managers seriously consider you as a candidate, you need to prove that you are not only capable of performing a wide variety of duties but also of communicating and interacting effectively with others. The key to demonstrating these skills on paper is to have a strong, well-written resume. Don’t get mixed in with other similarly qualified applicants. Use our HR resume templates to help you format your resume and organize your information. Our large selection of proven resume templates allows you to pick the one best suited to your industry and personality. We also offer resume writing tips so you know what to include in each section and can submit your resume with confidence. Why Use HR Resume Templates? Having an elaborately structured resume can actually hurt you by making your information difficult to locate and your resume confusing to read. Clean HR resume templates can help you stand out by putting the focus on your experience and skills rather than on the design of your document. When you choose a simple format for your resume, you can still modify it to make it more personal. If you want to get a little more creative with your resume, contemporary HR resume templates can show you how to use shading, font, and color to your advantage. Structured to look more like a newsletter, this type of fun, functional format can catch the eye of your reader while still presenting your information in a professional manner. If you are a recent graduate or are beginning in the HR industry, it can be helpful to format your resume in a way that prominently displays your relevant skills and education. This allows you to demonstrate your strengths and can be a positive way to write a resume if you lack previous work experience. Its simple structure also showcases any volunteer work or extra training you did. Many times, companies will use computer programs to filter through resumes and weed out the undesirable ones before passing the documents on to a hiring manager for review. This means you now need to ensure your resume will impress a machine as well as a person. 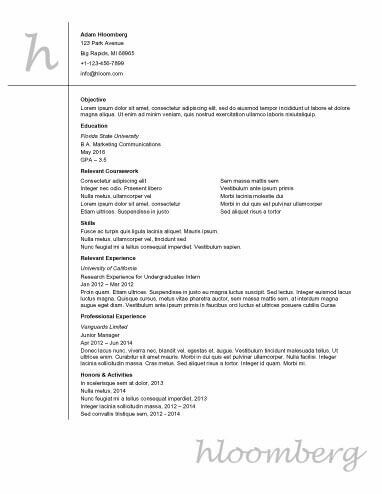 Using a modern format for your resume can save it from premature rejection. Because the format of these chronological HR resume templates is extremely common, it can increase your odds of getting called in for an interview. These logical templates structure your information in a way that emphasizes your past work experience and accomplishments. Hiring managers are usually familiar with this format and can easily locate any of your information they are looking for on it. Using HR resume templates can help you format your resume correctly, but you still need to fill it with your information. If you want your resume to put you one step in front of the competition, Forbes recommends including context details. Sometimes, it is difficult to know which information to use and what is extraneous. Use our writing tips to make your resume powerful. Address: While it is unnecessary to include a house number or street name, you may add it if location is key to getting the position. Email Address and Phone Number: Make sure they are easy to locate and correct. Only use a professional email address, typically one including your name. Social Media Profiles: In industries where networking is paramount, you may include the URL to your professional profiles, such as LinkedIn, but refrain from sharing a Facebook or Twitter profile. Show Intangibles: Mention desired character traits, such as "driven" or "excellent communicator"
Know Your Limits: Keep your list to your best six to eight skills. Only include those most relevant to the position you’re applying for. Recognize Your Audience: When you personalize your resume to the company you’re applying to, you can show the reader you understand what the company is looking for and what it values. Use Company Language: Pick keywords and phrases from the job description and use them in your skills section to make your resume stronger. Let us take care of the more difficult aspects of writing a resume. When all you have to do is fill in your information, you can submit your resume with confidence. Start now and have an impressive, professional resume that will entice prospective employers in no time.